The Fish Store is constantly getting new saltwater fish, corals and the latest in aquarium technology. Click on any of the icons below to follow us on any of our social media channels, and we will let you know when new and interesting things arrive and happen at The Fish Store. We carry a large selection of rare and collectible corals that and beautiful splashes of color throughout your aquarium. Corals arrive often, and in limited quantities. Come see them for yourself before they're gone. Part of the joy of owning a saltwater aquarium is knowing how to take care of your fish tank, whether you are a new aquarium owner, or if you have had your tank for years. Stop by the store and our friendly staff will be more than happy to answer your questions. We also offer free water testing in the store. and the people who love them. With the largest selection of fish and corals in the Southeast, The Fish Store offers choices to fit all experience levels and budgets. We are a full-service store, with aquariums for sale of all sizes, and an aquarium maintenance service company all under one roof. Our fish range from the classic standards, like clownfish and yellow tangs, all the way to super-exotic fish, like the Japanese Dragon Eel, Brazilian Sea Horses, Rhinopias, and many, many more. 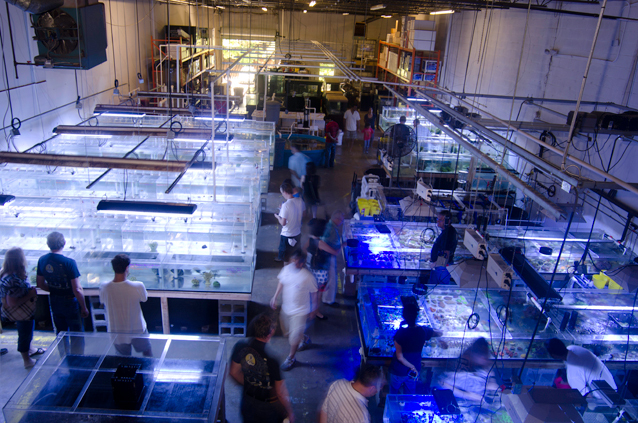 Visiting our store is like entering a world of exotic tropical fish, without the long lines downtown. Corals add variety and color to any tank. Our coral selection is very large, with a wide variety of colors and shapes. Take your time perusing our tanks and find the ones perfect for your home aquarium. Whether you are looking for a new home aquarium or want to put a saltwater aquarium into your office, we have many choices for you. We can also have tanks custom made for you, so you can always be assured of a perfect match for your needs. Keeping your tank clean and water perfectly clear are vitally important to the health of your fish. We offer full maintenance services, whether you just need a visit once a month, once a week, installation, or anywhere in between, we have an Aquarium Maintenance company in-house to take care of your tank when you want them to. We look forward to your visit to The Fish Store! The Fish Store is open from 11am-5pm every day. Need help with your aquarium? We offer full aquarium services with our own in-house maintenance company, Advanced Aquariums. Staffed with Atlanta's top aquarium service maintenance experts, we can help you enjoy your tank more.